As eluded to in a previous post, the major challenge that has emerged for the global Occupy movement is not shadowy networks of capitalist conspiracies or repressive totalitarianism, it’s something far more benign: discretionary local council by-laws. The problem facing the Occupy movement is not the lack of a clear message or the incoherence of the protesters’ concerns. Nor is it a lack of public support for the broad principles it stands for. Indeed, in the short life of the movement it is garnered a surprising breadth of support and influenced public debate around what are deemed acceptable levels of corporate profits and the associated social and economic harms that these profits entail. Accordingly, it is concerning at the level of democratic discourse, and disingenuous at the level of public policy, that local councils should be limiting the ability of a global movement with a vision of social and economic justice to flourish, instead smothering it with public order and occupational health and safety guidelines. This post focuses on the local ordinances invoked by the City of Melbourne to justify massive police action against occupiers, but similar stories can be told in Oakland, New York, Sydney, Brisbane and around the world. The forcible eviction from City Square and the banning of structures from Treasury Gardens has severely effected the ability of Occupy Melbourne to operate. This has at times thrown the movement into crisis and threatened its existence even as the wider debate it provoked continues to spread. 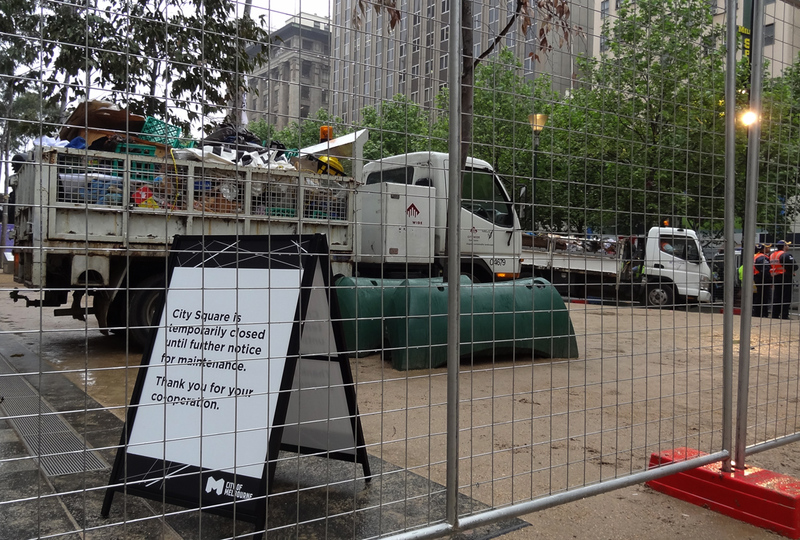 This decision to limit actions of Occupy Melbourne, as fellow blogger Peter suggested, has worrying implications for the very notion of ‘public’ space insofar as there are very evidently limits on how it can be used and for how long. Essentially the regulations make impossible within the public spaces of our city to conduct continuous open forums for discussion and debate where members of the public can at their leisure visit and participate. This is the substantive effect of the way in which Robert Doyle has chosen to enforce the City of Melbourne’s by-laws. There has been no attempt to reasonably allow for this novel form of social change to take place. The refusal has been staunch and enforced using massive amounts of tax-payer resources. If public safety, hygiene, or even aesthetics were really the concern why not raise them? Offer to negotiate or suggest how these regulations might be met. Members of Occupy Melbourne would no doubt be happy to cooperate with demands for the spaces it inhabits to be maintained in a way that is safe, orderly, hygienic and responsible to the wishes of other members of the public. Indeed this has been a major part of the logistical operations taking place within its working groups. The City of Melbourne ought to be more honest and transparent in its actions against the protesters. At present it is using whatever laws it can to clamp down on public protest, even if it goes against the spirit and intent in which the laws was made. For instance, the ‘move on’ laws being used against protesters by police on Friday 21 October were designed to quell drunken violence on King St, not quash political protest. This is at best a disingenuous use of the law and at worst illegal. Furthermore, at present the right to protest is protected in Victoria, but this is overlooked, or at least made conditional given that these protests presently take the form of fixed sites and indefinite durations. If Robert Doyle doesn’t like this form of political protest, he should have the guts to back himself and pass a new law that places a limit or a condition on the right to public protest; public protest would only be allowed for a certain amount of time and only in a certain way. The public (and quite possibly higher legal authorities) could then judge for themselves whether such laws are are acceptable to them. The notion of such a law may seem abhorrent and out of touch with the spirit of modern Australia but it would simply a more open and transparent version of what is currently being enacted underhandedly by the City of Melbourne. *Note: I am not a lawyer and am happy to be corrected on points of fact. This is part of a series of posts on the Occupy movement.